Nova Southeastern University was pleased to welcome Elie Wiesel, Holocaust survivor, author, and winner of the 1986 Nobel Peace Prize, to NSU's main campus on Thursday, February 23, 2006, from 7:00-8:30 p.m. in the Miniaci Performing Arts Center. Elie Wiesel is the author of more than forty books of fiction and non-fiction, including The Time of the Uprooted, published in August, as well as A Beggar in Jerusalem (Prix Médicis winner), The Testament (Prix Livre Inter winner), The Fifth Son (winner of the Grand Prize in Literature from the City of Paris), and two volumes of his memoirs. Wiesel's visit supported the academic theme of "Good and Evil" through classroom activities and public events. To complement Wiesel's visit, two special events explored the issues of torture and of sports performance enhancement. Both are topics of great current social concern. After the war, Elie Wiesel studied in Paris and later became a journalist. During an interview with the distinguished French writer, Francois Mauriac, he was persuaded to write about his experiences in the death camps. The result was his internationally acclaimed memoir, La Nuit (Night), which has since been translated into more than thirty languages. In 1978, President Jimmy Carter appointed Elie Wiesel as Chairman of the President's Commission on the Holocaust. In 1980, he became the Founding Chairman of the United States Holocaust Memorial Council. He is also the Founding President of the Paris-based Universal Academy of Cultures and the Chairman of The Elie Wiesel Foundation for Humanity, an organization he and his wife created to fight indifference, intolerance and injustice. 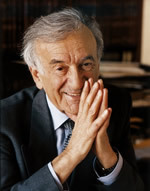 Elie Wiesel has received more than 100 honorary degrees from institutions of higher learning. A devoted supporter of Israel, Elie Wiesel has also defended the cause of Soviet Jews, Nicaragua's Miskito Indians, Argentina's Desaparecidos, Cambodian refugees, the Kurds, victims of famine and genocide in Africa, of apartheid in South Africa, and victims of war in the former Yugoslavia. For more than ten years, Elie and his wife Marion have been especially devoted to the cause of Ethiopian-born Israeli youth through the Foundation's Beit Tzipora Centers for Study and Enrichment. Teaching has always been central to Elie Wiesel's work. Since 1976, he has been the Andrew W. Mellon Professor in the Humanities at Boston University, where he also holds the title of University Professor. He is a member of the Faculty in the Department of Religion as well as the Department of Philosophy. Previously, he served as Distinguished Professor of Judaic Studies at the City University of New York (1972-76) and the first Henry Luce Visiting Scholar in Humanities and Social Thought at Yale University (1982-1983). For his literary and human rights activities, he has received numerous awards including the Presidential Medal of Freedom, the U.S. Congressional Gold Medal and the Medal of Liberty Award, and the rank of Grand-Croix in the French Legion of Honor. In 1986, Elie Wiesel won the Nobel Peace Prize, and soon after, Marion and Elie Wiesel established The Elie Wiesel Foundation for Humanity. An American citizen since 1963, Elie Wiesel lives in New York with his wife and son.